The mercury's rising, with temperatures expected to set a new record high for the UK. What does extreme heat do to people's behaviour - and how best to cope when it's hot? Britons do not have a good track record in dealing with extreme heat. We look forward to summer, up until a heatwave coincides with a working day. Faced with a badly ventilated place of work, reached by overcrowded, inefficient transport, we get angry. Very angry indeed. There are scientists who believe the weather can have a direct effect on our state of mind. Some researchers say the presence of large numbers of negative ions - negatively charged particles - in the air we breathe can lighten our mood. For the believers, the best place to be is where there is moving water or on mountains. Psychologist Professor Alex Gardner says many people might be feeling the shortage of negative ions as they swelter in breezeless cities. "You get this dull heavy atmosphere. When you are at the seaside or up in the mountains there is a buoyant atmosphere. The Moors used to design inner courtyards where water was always running, with trees to soak up the heat. "People get a bit fidgety, as when there is the possibility of thunderstorms." But there's dispute over whether an Innovations catalogue-style ion generator can demonstrably improve your mood. So if the boss is amenable, head for a waterfall, mountain range or the seaside. Even if the sceptics are right and theories about ions are bunk, you'll at least have had an enjoyable trip. There are other changes in our behaviour that arise from the heat. "When you are dehydrated, your body is under stress. It changes your mood and you choose stereotypical solutions rather than rational solutions. You get into the 'child state'. You whine and moan. There is anger, irritation, poor judgement and fatigue," says Prof Gardner. "We are normally good at multi-tasking but when it gets too hot you become an accident risk to yourself and other people." Psychologist Dr Joan Harvey studies the effects of high temperatures on workers in foundries and bakeries. "If you are not 'adapted', at anything between 77-85f (25-29C) you will start to feel uncomfortable if the humidity is high. A high humidity temperature of 25C can feel as bad as a temperature in the 30-35C range." And the advice to improve your psychological state? Protect your physical state. 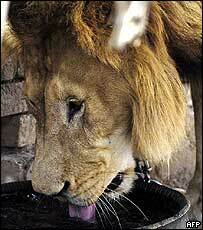 Drink lots of water, avoid unnecessary activity, stay in the shade. To experience the mood-changing nature of extreme heat in full effect, get in a car and hit the road. 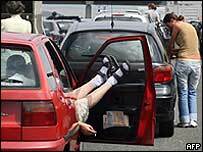 Edmund King, executive director of the RAC Foundation, is convinced that extremely hot days see a jump in incidents of road rage. "We have looked at road rage over the past five or six years. You do tend to find there are more incidents when the weather is hotter. People get stuck in road works, they get frustrated because it is hot, particularly if they don't have air conditioning. They tend to literally lose their cool. You might have children and they might be crying." Where pedestrians might bump into each other, apologise, and move on, the most minor incidents on the road can be blown out of proportion. Mr King advises that motorists allow extra time for journeys, check the Highways Agency website so as to avoid jams, and most importantly do not respond in any way to inconsiderate drivers. "Try not to over-react. If a car cuts in front of you, rather than flashing your lights or beeping, try to put it into context. He will only be one car ahead of you. You can minimise the risk of being a victim by not abusing other drivers yourself." But does hot weather and frayed tempers lead to increasing crime? The academic study, the Impact of Exceptionally Hot Weather in 1995, commissioned by the government and carried out by the University of East Anglia, found "no significant relationships" between the total number of offences and the weather. But it noted that sexual offences were 5-15% higher in the unusually hot months in 1976, 1989 and 1990. In 1995, there was "no weather-related response". A US study from Harvard University paints a more subtle picture, suggesting that a heatwave can trigger a short-term rise in crime, just as cold and very wet weather can reduce crime. But in the days and weeks following such a "weather shock", the crime rate re-adjusts itself - with crime falling after a heatwave and rising after a cold snap - so that the average figures show little difference. David Ross, general manager of Knowsley Safari Park, thinks we can learn from the lions and other exotic animals he looks after. "Only mad dogs and Englishmen work in the sun. The animals of the Serengeti won't be working for a living. They'll be chilling out, finding shade and water. "Elephants like swimming, or a mud bath. Rhinos wallow in mud. In the Serengeti, there won't be much activity in the heat of the day." The TUC has called upon employers to let their workers dress down to beat the heat. But spare a thought for those whose jobs means there is no latitude for open-necked shirts and short. But as historian Sir Roy Strong said: "One saying has it that the British Empire began to collapse when the first man sat down to dinner in shorts". At the Ritz in London, doormen will still appear in top hats and long coats. 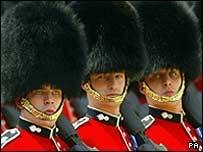 And over at Buckingham Palace, the guards will be sporting their bearskin hats as usual. A spokesman for the MoD says: "Many of them are already stood in the shade. We make sure they take on board plenty of water. Service in Iraq and Afghanistan has helped educate people more about the effects of heat. "We will shorten the rotations from two hours down to one hour. We can move some of the sentry positions so they are in the shade. But the hats stay on." So if a law required offices to close above a certain room temperature, employers would install air conditioning? To air-condition a building means that, while the inside is cooled down, a huge amount of heat is pumped out somewhere on the outside. That makes the streets even hotter, contributing hugely to the Greenhouse effect - literally heating the planet. In order to adapt with any kind of future in mind employers have to learn instead that there is a limit to productivity, and begin to make do with a little less comfort and profit all round. You know, five minutes with a web browser and a clue would show that this whole negative ions idea is a load of rubbish. If it were true, then merely watching TV would make us ecstatic, what with its electron gun within the CRT. Sorry, the heat must be making me cranky. If this recent spell of hot weather is set to be the norm is years to come, then perhaps employers should start looking now at ways of restructuring the working day to allow for a siesta. My employer Royal Mail are in talks now about doing just that, unfortunately by the time a decision is reached the heatwave will be over but maybe we will be ready for next year. I'm impressed that the MoD spokesman has almost justified the wars in Afghanistan and Iraq on the basis that it helps men in bearskin hats cope better with the heat. Perhaps Blair should consider using this fine excuse. It is terrible that people have to work in temperatures above a certain level. Especially for offices were there is no ventilation, no kitchen to restock with cold drinks, and uniforms that include woollen trousers. There should be a law that states if a room's temperature is of a certain heat that the office must close. I guarentee that employers would then get air conditioning installed or the correct ventilation. It's all very well David Ross saying we shouldn't work on hot days like this, but i've just taken five minutes out of my day to read this and got told off by our office manager. Damn fascists. I keep my cool by drinking lots, cooling down in the river after work and acting like a lazy hippo. I wonder if we and everybody else would consider working 7 days a week so they can have the same amount of time off during the summer months and kids at school? I can't believe in our modern world how daft some rules are regarding dress codes. Making our soldiers where those ridiculous hats in this heat (well in general really), is pure madness. The heat they must suffer will surely 'weaken' them and effect their normal working state? If they were protecting me I'd prefer them to be 'cooler' and in a better state of health than burning up in this heat with half a bear stuck to their heads! I'd like there to be a set temperature where children don't have to go to school. Not because I want to skive, just because I can't concentrate and it really is too hot. I found the perfect way to cool down on the sweltering Northern Line into work today. I popped a couple of Polos (any mints will do) followed by a large glug of water and swirled the mints in my mouth. I actually shivered with the coolness! It amazes me that people insist on running for tubes, even in this heat. Tubes arrive every 3 minutes, they are all as packed as the next. What's the rush? Get yourself a bottle of water, enjoy the escalator ride and the breeze you often get there.